Everett was due October 1st, 2009. I was greatly anticipating his arrival, and was – perhaps – the most antsy I’ve ever been with the anticipation of a birth. Olivia had come right on her due date. Cal came a few days early with a scheduled induction. I decided I wanted Everett to come on his own, but also didn’t want to push my luck in the health risks (plus, let’s be honest, I just wanted him here! ), so I decided I would wait one extra week. If he didn’t come, then I would schedule an induction for one week past his due date. On the 7th I went to the Dr’s, and with no signs of going into labor, I scheduled an induction for the following morning. It wasn’t ideal, but it didn’t look like I had any other choice. That night we were all ready to go. Olivia and Calvin were going to Kellie’s in the morning just until Lois could come get them. I was to call the hospital at 7 am to see if they had room for me (inductions always take second priority to natural labor, go figure). Bags were in the car. At 11:00 I ate my last bowl of cereal (you can’t eat after midnight), kissed Wyatt and went to bed. Still, there was no sense of urgency, so when we stopped at Kellie’s, Wyatt took the kids and their supplies in, and stopped to chat while I waited in the car. That’s when I really started to hurt. It finally dawned on me that it wasn’t constant pain – it was pain every few minutes. Not sharp, not overwhelming, just achy exhausting sort of pain. I waited for Wyatt . . . and waited, and waited, and waited. He seemed to take an aweful long time. Finally I called him on the phone and told him he needed to come NOW. So instead of inducing labor, they actually had to try and slow it down. I was Strep B positive and needed at least 4 hours of antibiotics before he was born. Once that 4 hour mark hit, they said I could start pushing, and Everett was born about five minutes later. 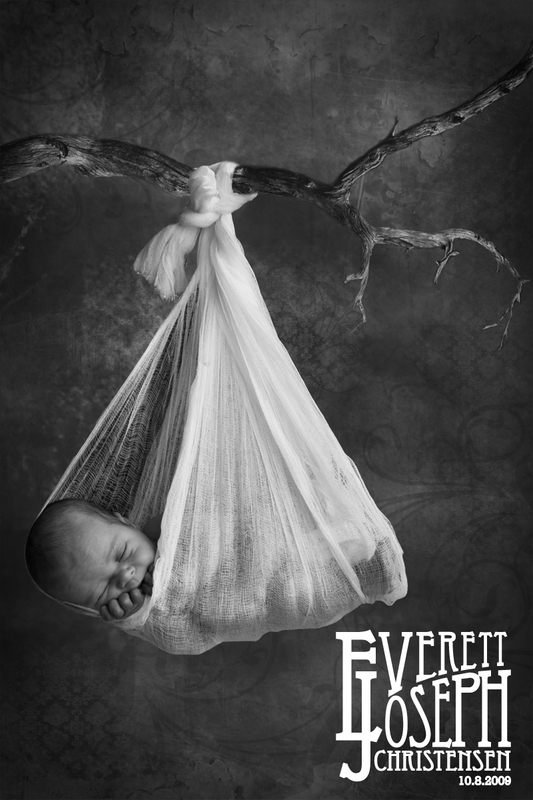 So – basically, it came down to a game of Chicken – Everett wasn’t going to be born unless we made him. But once we tried, he wasn’t going to let us have the satisfaction. He was going to do it on his own. Silly, sweet, lovely boy. Oh, LOVE the pic of him ~ Precious!!! !